What do you do if you have two data loggers installed really close to each other and you only want to pay the bill for running one cellular modem? How do you get data from both data loggers using a single modem? How do you get your data loggers to read the values from each other’s data tables? The short answer to these questions is to use PakBus networking. In this article, I’ll share with you how PakBus networking works and its many possibilities—all in the context of collecting data from two data loggers with a single cellular modem. PakBus is the proprietary communications protocol for Campbell Scientific data loggers. The name derives from the fact that it is a packetized data bus. All data is transferred in packets that include destination and source addresses. It is optimized by design to work well on low bandwidth connections (such as with radios). What are the benefits of using PakBus? At the same time, several devices can be connected to and communicating with a single data logger. Data loggers can control other data loggers without the use of a PC. The network can change automatically as devices are added or removed. This also provides redundant communication paths. The easiest way to design a PakBus network is to use Network Planner. (Network Planner has been included in LoggerNet since version 4.0.) This tool was specifically designed to help you set up data loggers in PakBus networks so that they can communicate with each other and the LoggerNet server. 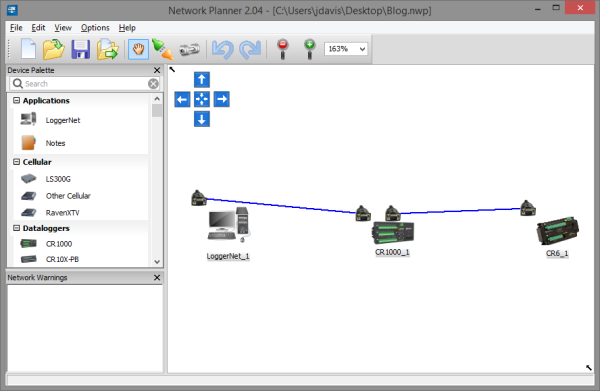 Network Planner allows the graphical layout of devices and the specification of the links between the devices. It can then use that information to generate settings for all the devices and provide the means to program those settings into the devices and also to configure LoggerNet. Tip: To access Network Planner, open LoggerNet, navigate to the Tools menu, and click the Network Planner link. Recommended for You: If you’re not familiar with Network Planner, watch the “LoggerNet Software | Network Planner” video. In this example, I’m going to add LoggerNet software, a CR1000 datalogger, and a CR6 datalogger to the network. I connected LoggerNet to the CR1000 on ComRS232, and I connected the CR1000 Com1 to the CR6 ComU1. Each data logger has a different PakBus address. A matching baud rate is set on the corresponding comport on each data logger. A beacon interval is set on one of the data loggers. The data logger with two connections has IsRouter set to True. When you are doing your wiring, remember the phrase “Transmit to receive. Receive the transmission.” It will help you remember to connect Tx from one data logger to Rx on the other. If the data loggers have separate power supplies, also connect G to G.
Shielded, twisted-pair cables will work at much longer distances than separate wires. You can twist individual wires together as shown in the previous image to get most of the noise rejection. Lower noise will allow longer cable distances at higher baud rates. If a connection is not working, try lowering the baud rate. After the settings from Network Planner have been applied to LoggerNet and both data loggers, you are able to communicate to the CR6 through the CR1000. You may send programs, collect data, and even change your settings. At the beginning of this article, I mentioned using one cell modem for two data loggers. 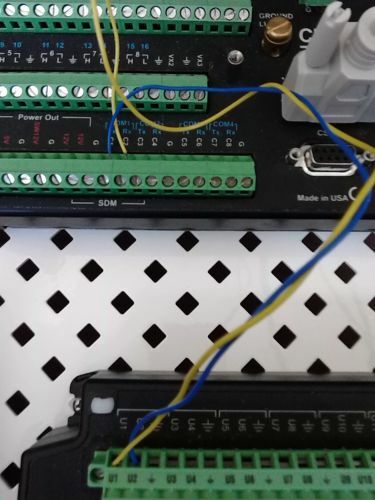 The only change needed is to add a cell modem to the CR1000 and use that in place of the RS-232 connection to LoggerNet. You will still be able to collect data from the CR6. You can also add a radio onto the CR6 for communication to a dozen CR206X dataloggers. It is possible to add more data loggers to the network until you reach the throughput limits of your communication links. CRBasic instructions even exist that allow one of your data loggers to collect data from another. You can find them listed in the PakBus category of instructions in the CRBasic Editor. As you can see, there are many possibilities when you use PakBus networking. It might seem a bit complicated at first, but a tool such as Network Planner makes it simple. Putting PakBus networking to work for you can really simplify your job. Don’t forget to also add a Device Activity in Network Planner to enable Scheduled Collection. Scheduled Collection can automatically poll data from any station in the PakBus network. We created the PakBus communications protocol for our data loggers because we know your measurements matter. Recommended for You: If you'd like to learn more about Network Planner, review the "Tips and Tricks: Get Active!" newsletter article. If you have any questions or comments about PakBus networking, post them below. Should I open the SerialPort in the CRBasic program? Or does the Network Planner do it for me? The baud rate setting that Network Planner configures on the datalogger will open the serial port. There is no need to use SerialOpen in your datalogger program. Do Loggernet Servers that communicate with one another using TCP/IP utilize the Pakbus protocol or is Pakbus strictly used for Server-to-Logger and Logger-to-Logger communication? If you look at your network in Setup of LoggerNet, anything going through a PakbusPort is using PakBus as the protocol.